I have been disappointed this year because it seems that in some stores, Fall is being taken over by Halloween and even Christmas! I mean, those are two great and important holidays, but I would like for once, rather than striving to get ready for the season ahead, to take the time to breathe in the season that is now falling all around us. The magic word - now. I think that in pausing to enjoy the now, life finds a new calm and peace. So, to honor my desire to enjoy the season now, I have created something that merges several things that remind me of Fall. 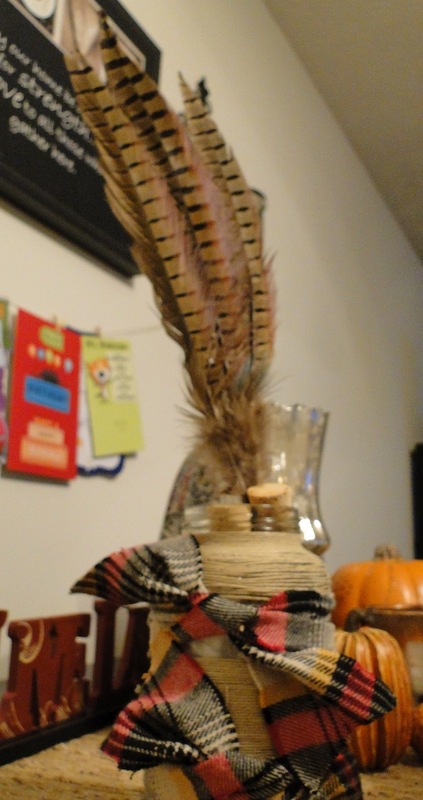 These items include red and yellow flannel, twine, wine corks, and feathers! I know, these are kind of random things, but they really do remind me of Fall and help me to stop and soak in the moment (now I just need an Amish market, an old red barn, and a field of sunflowers to complete the idea!). Using your hot glue gun and only a tiny amount of glue, wrap your twine/jute/raffia around the jar or bottle, glueing down every few inches. A trick that I learned: As you go around the vase and come to a part that was previously glued, if there is a big wad of glue in the line of your twine, use your fingernail to cut the extra glue away from what is holding the last run and get it out of your way - this makes it much easier to make it look smooth. If you choose, you can put your twine around the entire vase, but I did mine in sections to save time, rather than glueing twine under where I planned to put the flannel. 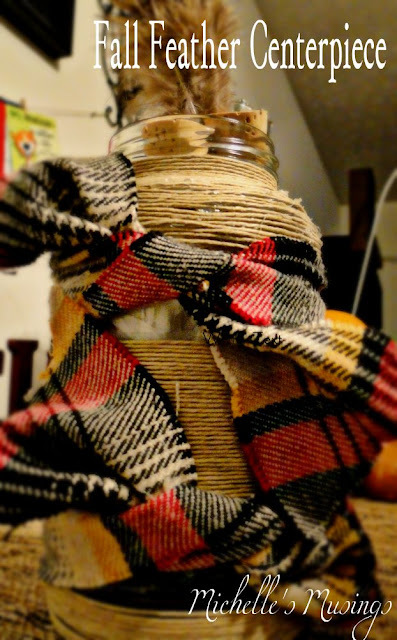 Once I finished glueing the first section of twine (from the top of the vase until a little way down), I took one strip of flannel and tied it around the vase. I cut the edges into Vs and turned them under, so they would not stick out so much but have a little class and purpose. I then glued another section of twine and tied another piece of flannel around the vase. Then, I did another section of twine, and I was finished! Then, like Yankee Doodle, I put a feather in my hat! Well, in my vase. The stem was too long, so I bent it to the length I wanted it. I did not have wire cutters in my immediate vicinity, so I just left the extra. I think that is ok! And just as simple as that, you have a nice little piece to remind you to step back and enjoy the beautiful moments of Fall. They are fleeting! So, after you read this and Pinterest a little more, grab a good book or magazine or a good movie, some yummy warm coffee (or something stronger, if that tickles your fancy), and your favorite flannel blanket, open the window, and enjoy the beautiful moment! 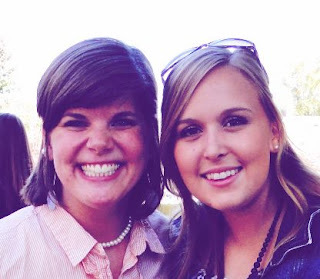 Happy crafting, and Happy Fall!! !